the cozy recipes just keep on coming. this time? 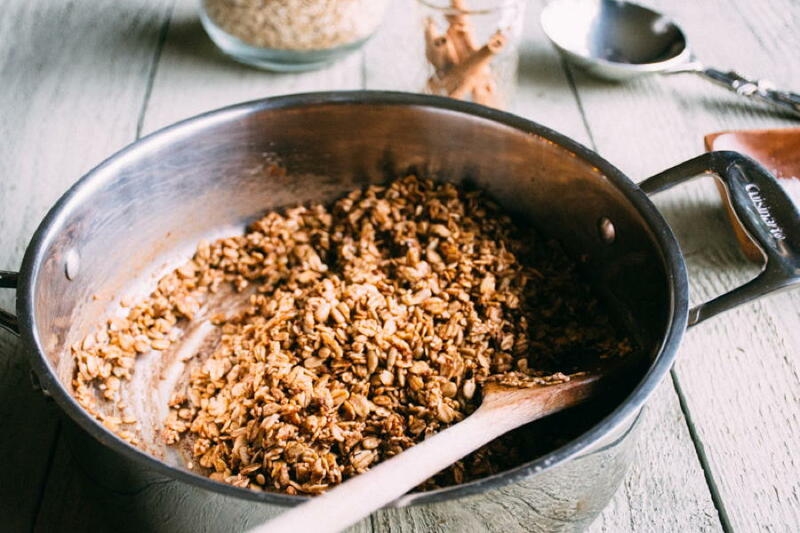 maple sesame skillet granola! 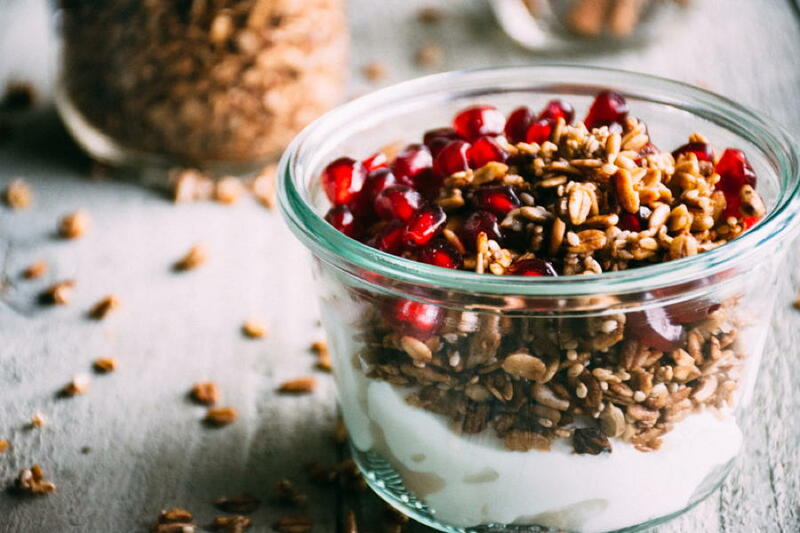 this is officially my new favorite granola recipe (!!!) and it couldn’t be any easier to make. it’s also the second piece of the roasted apple cinnamon smoothie puzzle, but let’s just say that we haven’t been holding back with this stuff in our kitchen. kind of like those roasted cinnamon apples the applications are endless. besides being the perfect topping to that smoothie recipe that’s coming your way (soon! promise. 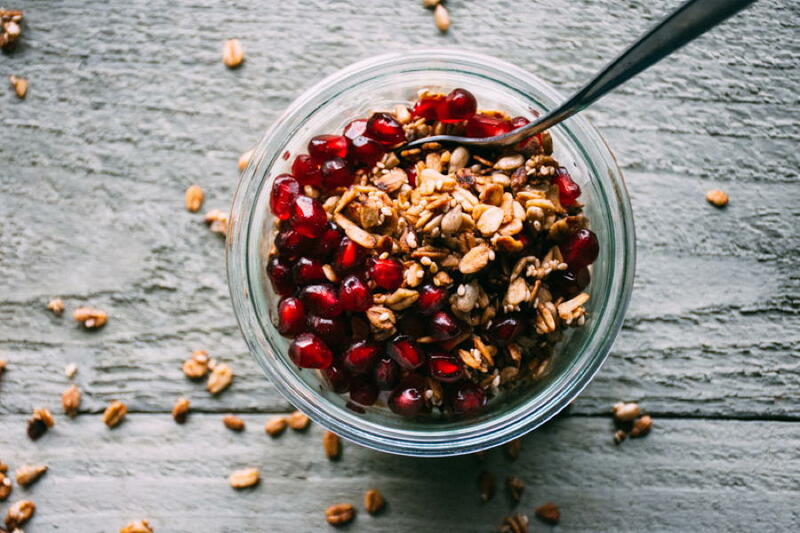 ), it’s especially good on a bowl of greek yogurt with juicy pomegranate seeds (the berry of the winter! ), or added to your chia seed pudding. and if you’re thinking about warming up some of those roasted apples to serve with vanilla ice cream? well you might just want to sprinkle a few tablespoons of this stuff over the top too. been there, done that. so good. 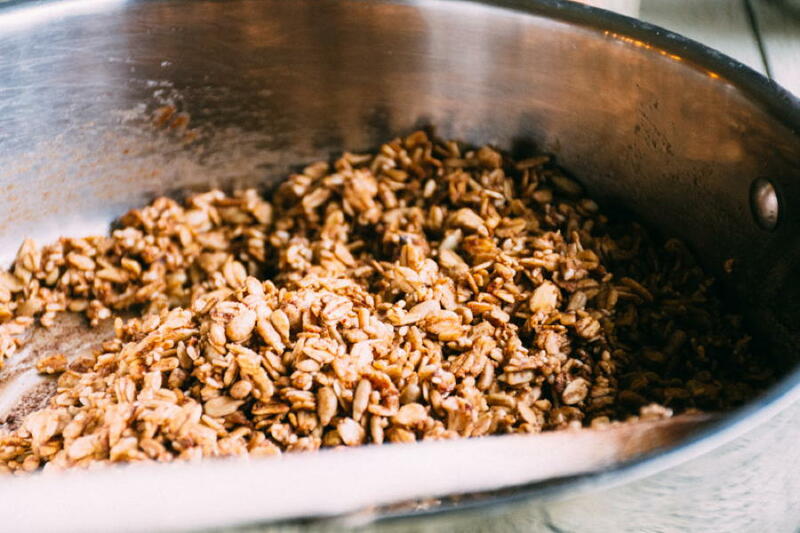 it’s a fairly crisp granola, with just the right amount of bite to satisfy. nothing too fancy in the ingredients list but the simplicity of the flavors shine through in all the right ways. 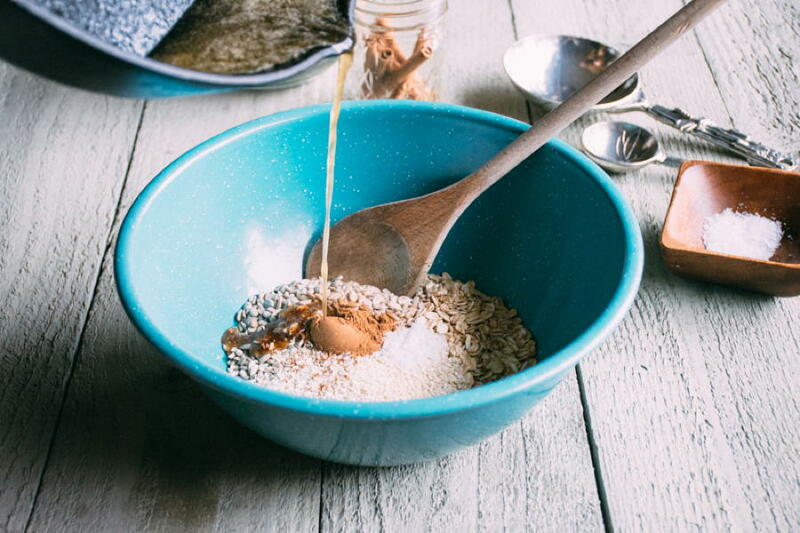 there’s oats, sunflower seeds, sesame seeds and some cinnamon, maple syrup and butter (or coconut oil) to tie all the yumminess together. you melt the maple syrup and butter with the cinnamon and a bit of sea salt, pour it over the dry ingredients and mix well. and then the exciting part – magic granola skillet time!! 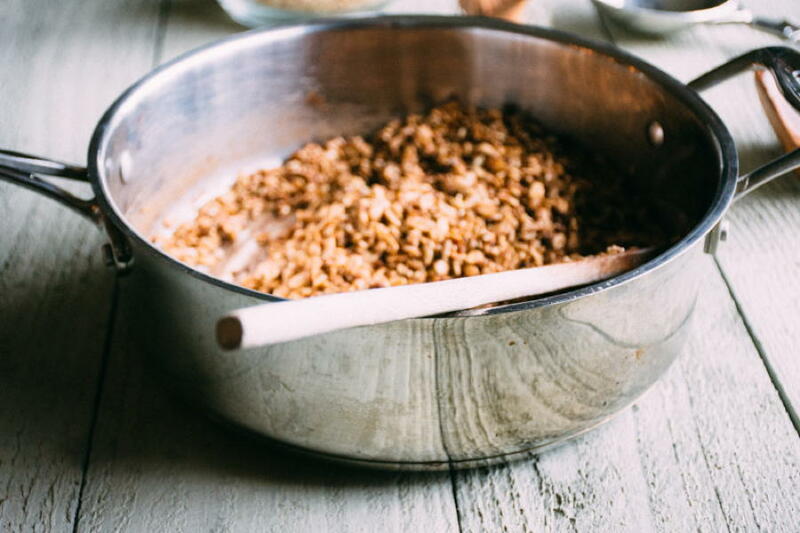 see, this granola recipe is different than any granola I’ve ever made because you’re going heat it in a skillet on top of the stove instead of baking it in the oven. pretty neat, right?! or maybe I’m just a weirdo who get’s excited about strange things like granola in skillets. either way I think you should try it, because it’s really quite tasty and super duper quick to make! like you could make it on a weekday morning quick. once the ingredients are all mixed together and it’s in the pan it only takes about 10 minutes to cook – with an equal amount of time to cool down and crisp up. cast iron, stainless steel, and my rarely used non-stick. I kind of expected the cast iron to be the star but it actually came in last place. the recipe still worked O.K. but there were less clusters of granola and it didn’t seem to dry out and crisp up as well. the non-stick pan was the best option, and the stainless steel came in second. 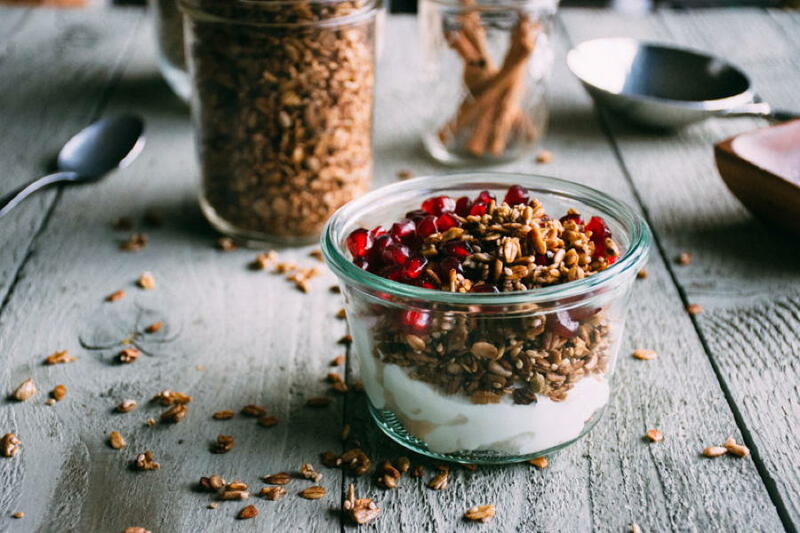 stored in an airtight container this granola will keep on your counter for at least 4 days. 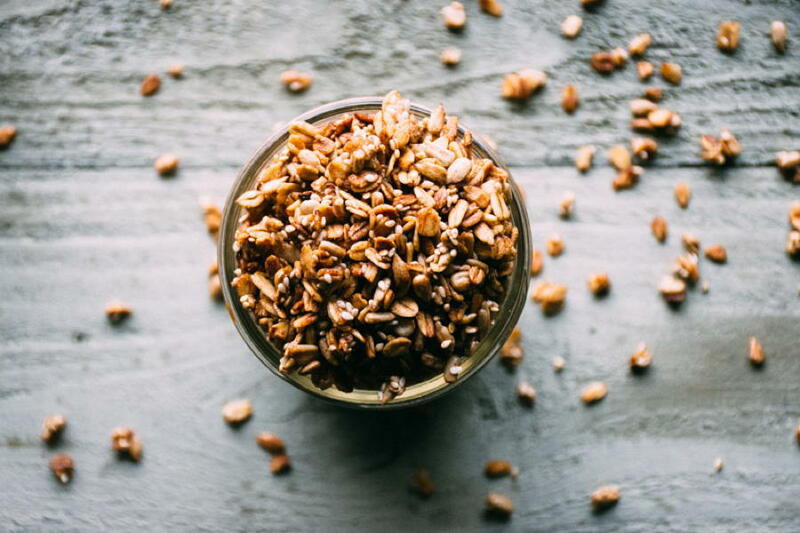 an easy skillet granola recipe with oats, sesame seeds, sunflower seeds, maple syrup, cinnamon and butter. can be made dairy free with coconut oil! 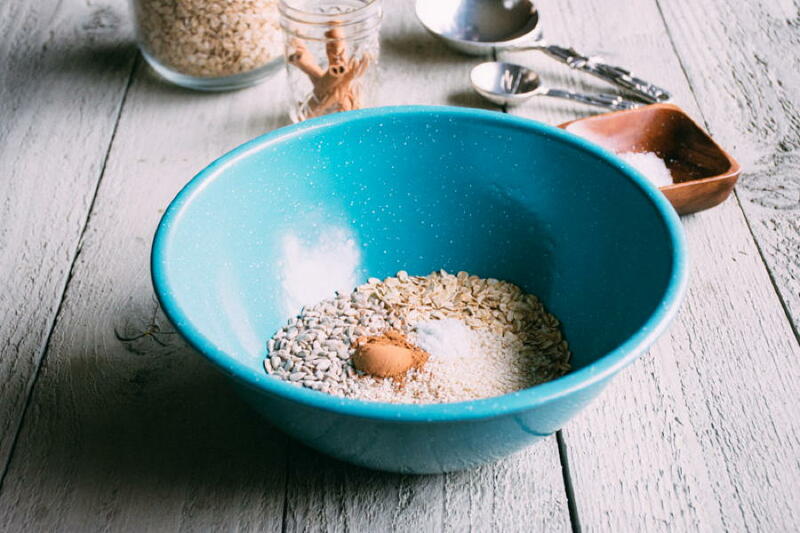 mix together oats, sunflower seeds, sesame seeds, cinnamon and sea salt in a large mixing bowl. heat butter and maple syrup over medium low heat just until melted. return to pan and increase heat to just barely below medium heat. cook for about 10 minutes, stirring every minute or so to promote even browning. 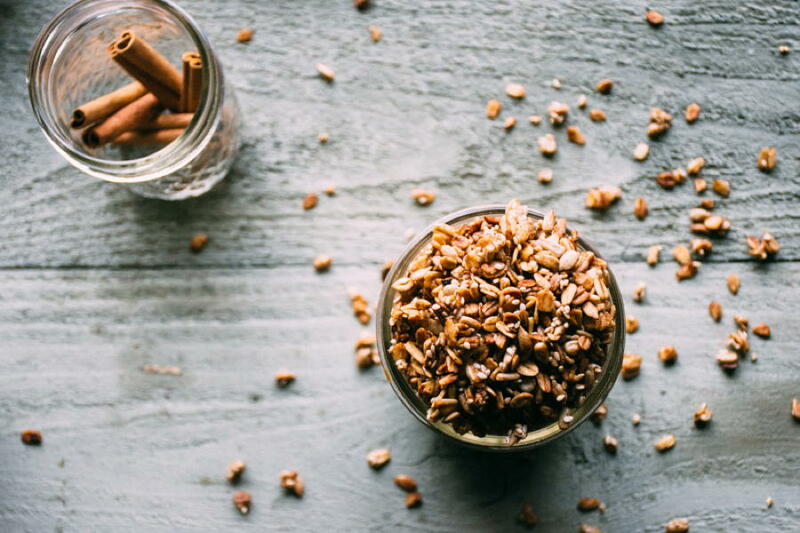 stir gently from the outside in, so as not to break up the clusters too much, until granola is toasty, fairly dry, and brown in spots. leave in pan off the heat (if using nonstick), or if using a stainless steel pan move to a shallow bowl to cool and crisp up for about 10-20 minutes. This entry was posted in breakfast, snacks, sweets and tagged easy, gluten free, healthy, vegan, vegetarian on December 26, 2015 by Nyssa Tanner.